You can read about why I am moving by clicking here. Note: This post was originally published on my other blog, Rachel Discovers Happiness, but I feel so strongly about it that I feel the need to publish it here as well. Empathy is a wonderful quality. It allows you to really connect with others. It allows you to feel their emotions, understand where they are coming from, and really take relationships to the next step. Of the qualities I value in myself, empathy is at the top of the list. I think I’m a good friend. I listen to people and genuinely understand where they are coming from. I am able to comfort people because I can honestly say that I know how they feel. On the other hand, empathy is an awful emotion. It allows you to feel other people’s emotions. Although I value my ability to empathize with others, sometimes it makes my life really difficult. Especially with negative emotions. When somebody is happy, it makes me happy too, but only to a certain extent. When somebody is sad, however, I feel those emotions much more intensely. If somebody is crying or upset about something, it physically makes my heart tighten. I feel like my chest is closing in, and often times I am able to hold myself together just as long as it takes for me to get out of their proximity before I break down in tears myself. Yup, that’s right, I feel other people’s emotions so extremely that their tears bring me to tears. The reason I am writing about this right now is because yesterday, a family friend of mine passed away. I got an email from my step mom earlier in the day telling me that his mother found his body yesterday morning. Although I have heard his name, I didn’t know him personally. He went to church with my step mom and my step sisters and he graduated from high school with my older sister. My step mom has nothing but nice things to say about his family. When she told me about his passing, I instantly replied, telling her that she had a huge hug waiting for her when she got home. My stomach dropped. My heart constricted. I didn’t know what to say. I gave her one more squeeze and when she went over to my dad, I went to my room and broke down. I sat on the floor up against my bed, with tears streaming down my face, and cried. I cried for the lost life of somebody so young, for his family and friends, and for my step mom who I rarely see that upset. As I was sitting there with tears streaming down my face, although my mind never went off of the young man and his family, I couldn’t help but think about how lucky I am that my family doesn’t struggle with things like hard drug addiction, drunk driving, or teen pregnancy (knock on wood… Pookie still has 8 months until she is officially out of the teen years). Although we do have our struggles, we are pretty tight knit and support each other. We take care of each other, and make sure that we stay on the right track. This young man’s family did everything that mine would do in their situation, everything they could think of to try to help him through his addiction – rehab, Narcotics Anonymous meetings, praying, etc. Through all of this, my mind has jumped from person to person who has passed away since my high school years. All of the young people I know who have died have been from one sort of substance abuse or another. I had a friend who died at 17 from drinking and driving. A boy a year or two older than me OD’d on Oxycotton. A young man I graduated with was shot in a dispute over drugs. This makes me extremely sad. What will it take for people to realize that doing those things doesn’t make you cool? Calling your parents for a ride home won’t make them as mad at you as drinking, driving and killing somebody would. Shooting heroin won’t make people like you more – and if they do, you probably don’t really want to be hanging out with them in the first place. Selling drugs may be a good source of income, but it’s dangerous and you are contributing to issues in so many other people’s lives. My step mom, kind of regretfully, told me that she kind of went off on her students yesterday. She was crying and lectured them to never try drugs. Never get into those types things because they are dangerous. She told them that she didn’t want to go another funeral – that it was so painful to watch young people pass away when they had so much more life to live. That not only would they be hurting themselves when they tried things like drugs or drinking and driving, but they hurt their families and friends too. She was kind of sad that she lectured them like that – I think it is extremely important that she did. If even one kid chooses to say “no” because of that lecture, she has made a positive difference (as she does every day in the lives of her students). Although empathy sometimes makes things difficult for me, I wouldn’t trade it for any other qualities (except, maybe, confidence…) My breakdown after that hug was painful, but it allowed me to look at my family and realized how blessed (or lucky, depending on your religious views) I am and how amazing my family and friends are. My heart goes out to those who are affected by drugs and alcohol. What my step mom said to her students is spot on – don’t even start with things like cocaine, heroin, etc. You aren’t just hurting yourself, you are hurting all those whose lives you have touched, and a bunch of people you didn’t even know you had an effect on. It really puts it into perspective that we get ourselves all worked up and nervous about things that really aren’t important. I have officially been an intern at SHIFT Communications for a week and a half now and it has been pretty great! The first few days were spent being introduced to everybody in the office and figuring out which accounts everybody was in charge of… That along with trying to keep up with all the acronyms thrown around in emails and everyday speech wore me out. Luckily, after diligently shadowing a few people on their accounts, I’ve been able to catch up a little bit and have even been handed some of my own responsibility. That’s pretty exciting, but I’m glad that I’ve had a bit of time to get used to the type of work I would be doing and the office environment. It’s nice to see so many people are around my age that have accomplished so much – it makes me believe that I can accomplish those things too! I get to spend time reading recent articles about things that I’m interested in – and it’s all part of the job! There are more, but those are the things that come to my mind right now. Is there anything better than a job that you enjoy doing, makes you smile, and combines so many of your passions? I think not! I feel as though everything in my life has been leading up to now. I’ve always had dreams for myself: go to college, live in a big city, have good relationships with my family members, get a great job, be proud of myself, be happy. I graduated from college in June. I have wonderful relationships with all four of my parents and all of my siblings, not to mention my extended family. I signed the lease for an apartment in San Francisco. I have an internship at a great company and I couldn’t be happier about it. I am proud of myself and all I have accomplished – especially the apartment and internship, two things that happened last week. I might not be as happy as I could be, but I’m working on it and all the things I just listed sure do help. Of course, I haven’t officially moved in to my apartment (that happens this weekend) and I haven’t actually started my internship (I begin tomorrow), but man, I just feel like my life is really taking off! Don’t get me wrong, there are a lot of things that I still want to accomplish in my life, but I am just now starting to feel like a real adult. All of my goals until now have been for my younger self. They were for the me that existed before 2012. The me that was focused on my profession, friends, and dreams. The 22-and-younger me only knew a life that consisted of classes, homework, papers, to and from campus, etc. etc. This new me, the 23-and-older me, has moved on from school, is entering the corporate world, and is ready for new challenges and experiences. Now, even though it is only 8:20pm, I think I am going to go pick out my outfit for tomorrow, crawl in to bed, read a book, and get a good night’s sleep before my big day tomorrow. San Francisco, I’m ready for you! This week was so crazy. I hardly had time to check email and read my morning websites. In fact, I don’t think I read my normal allotment of sites a single day this week, so I apologize for the lame links. As I said in my other blog, I’m not quite ready to share everything with Cyber Land yet, but I promise it will happen within the next few days. 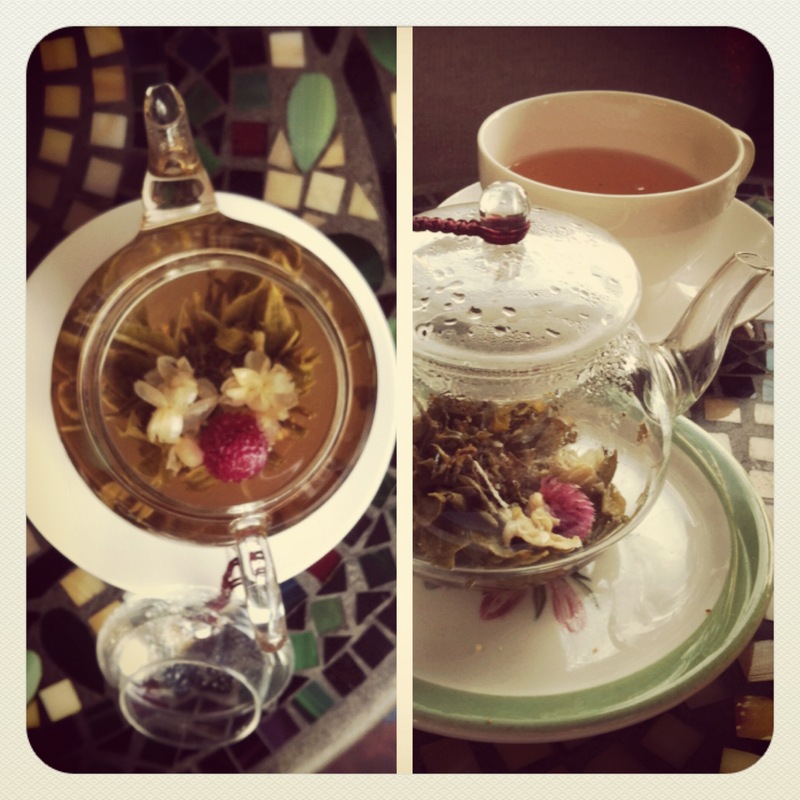 And a picture from today just because I thought this tea was pretty. I hope your week was productive and that your February started out wonderfully! I’m not sure if I mentioned that a lot of big things have been happening in my life over the past few weeks. I can’t explain them here just yet because I don’t want to jinx anything, but I will write about them soon enough (cross your fingers that things work out). Because of these things, I have been all over the Bay Area within the past week which hasn’t left too much time for blogging. I’m sorry I’ve been MIA. When she first asked me what I though the “next big thing” was going to be in social media, I thought for half a second and then replied with “social bookmarking sites.” We talked about it for a few minutes and then moved on. But even after our conversation was over and I was on my way home, that question stuck with me. What IS the future of social media? What will be the next site everybody’s talking about? We’ve already had Facebook which connects us with our friends, Twitter which allows us to follow celebrities and industry news, and crossovers between the two. New social media sites are being developed every day; I even had to create a separate email account so that I could send all my social media update emails there instead of getting them in my regular inbox. The most recent social media site that everybody is talking about, however, is Pinterest. I won’t get into long drawn out detail about what Pinterest is – if you don’t already know, you should go take a look at the site. Beware, it’s addicting. Basically, though, it’s a social bookmarking site. You find something online that you like (with Pinterest it’s pictures), click the handy dandy “Pin It” button that you install on your browser’s toolbar, and then everybody who follows you can see what you’ve pinned. Simple enough, right? Anyway, there are more and more sites like Pinterest that are coming out. SnipIt is one of my other favorites. I use SnipIt for news (three of my boars are SnipIt “favorites” and are featured on the main pages covering their topics) and articles whereas I use Pinterest for all things pretty and creative. People like to be in charge of the kind of information they read about/look at on the internet and sites such as Pinterest, SnipIt, ChimeIn, Digg, Reddit and StumbleUpon allow users to post links that they find amusing and share them with their followers. These platforms also give users the ability to choose their interests and find articles/information/pictures/blog posts on topics that they select, rather than topics chosen at random or “trending” topics (AKA topics that are most popular/talked about at that time). Within the past 12 hours I have read a few articles about what the future of social media is. According to the YouTube CEO, the future of content is niche channels. People have specific interests in a variety of topics — say, yoga and stand-up surfing — but it’s difficult to find a continuous stream of video content catered to those interests, Kamangar contends. What do you think? Do you agree with this assessment of changes in social media and news sites? How do you follow your interests online? What are your favorite social bookmarking sites? So sorry I didn’t post my Friday Links yesterday. This week has been pretty crazy. I haven’t really had time to relax, take a breath, or even think. I don’t want to tell you about it because I don’t want to jinx anything, but I’m crossing my fingers that some things come through for me. Woah... this blew my mind: goo.gl/COciF seriously, watch the video - visual explanation of how airplane wings work thanks @Gizmodo! Hmmm intriguing. Downloading physical objects: goo.gl/bPi28 ridiculous or revolutionary? Apple packaging comes down to an exact science: goo.gl/rb12K incredible!! What stuck out about this week for you? Did anything exciting happen? Any big news?